Clichés? No worries! The film provides Bollywood’s version of secular harmony, coincidences after coincidences with impossible odds, tight shirts in myriad colours, obviously staged fights in which opponents have time to make conversation, decorative ladies, disguises galore, miraculous cures and an evil villain who even has a good twin! How could anyone not like it? The storyline itself is a huge Bollywood cliché. A family is separated by evil machinations, poverty and bad luck. Three brothers are brought up following three religions. The evil man continues in his evil ways and even the good father seems to have become part evil – but then he is Pran, so what do you expect? There are three pretty ladies who look decoratively helpless on demand. But it all resolves itself after many unbelievable plot ploys with more holes than Swiss cheese! The pace of the film is brisk and there is never a dull moment. Rishi and Neetu make a handsome young couple and they play their parts with ease. Vinod and Shabana make a rather mismatched couple. Vinod is good as a police officer but Shabana…I prefer her in her serious roles. Amitabh has great comic timing and for his fans, there is even a dialogue with God! Parveen I am not a fan off but she looks quite beautiful and they make a good pair. Jeevan and Pran have undemanding and clichéd roles. Amitabh has the most screen time amongst the leads and he does a good job. Watch this film with suspended judgement and a healthy sense of humour and you’ll have great fun! The music by Laxmikant-Pyarelal has some numbers which made the charts at the time of release. It doesn’t really stand the test of time but provides good nostalgia value. Lyrics by Anand Bakshi are adequate. Khoon Khoon Hota Hai – Mohammad Rafi. Pedestrian. Pardah Hai Pardah – Mohammad Rafi. This very well-known Qawwali deserves its success. Rishi and Neetu glow with youth and Rafi is very good even though he is past his best phase. My Name is Anthony – Kishore Kumar. This fun song became very famous with Kishore’s voice suiting Amitabh’s comic timing and long-limbed prancing. A song to make you smile. Hum Ko Tum Se – Kishore Kumar, Lata Mangeshkar, Mohammad, Mukesh. A melodious song which is still very enjoyable. I like that it has three of the great male voices of that era singing the same song. Taiyabali Pyar Ka Dushman – Mohammad Rafi. Don’t remember this song and won’t in the future. Shirdi Wale Sai Baba – Mohammad Rafi. A song which used to be run often in the radio, it seems ordinary now. I am normally much attracted to Qawwalis but not this one. 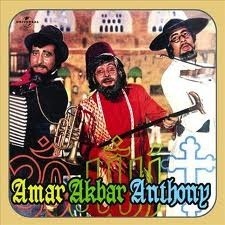 Amar Akbar Anthony – Kishore Kumar, Mahendra Kapoor, Shailendra Singh. Familiarity made me listen to the song with pleasure rather than it’s musicality. In honour of three great male singers of Bollywood, and to see all the leads on screen, here is Hum Ko Tum Se. Rajesh Khanna was named a ‘Phenomenon’ by the press of those times. There was a period when he ruled the box office like no other actor before him. His films were all super hits, he had a crazed fan following, and the songs he lip synched were lip synched by all of India. How did he do it? A man of average looks and average stature has an uphill task in the mainstream Indian film industry; this is a land where a beautiful actor with no talent can succeed more easily than a talented actor with no looks. So why did he succeed? I think perhaps because he had Charisma with a capital C! In trying to choose a song for him, I am overwhelmed because many of the songs associated with him are very dear to me. I was an impressionable young girl in his times of success and though I didn’t watch many films I was passionate about the music. I remember hours of late evenings spent on our छत, the flat rooftop/balcony, looking up at the stars while holding a transistor radio to my ears (no you young ones, we didn’t have mp3 players at that time !) Let me mark the ones I remember best. I start down memory lane with Mere Naseeb Mein Ae Dost (Kishore Kumar) from Do Raste (1969), a perfect song for Rajesh Khanna. In the same year, there was Woh Sham Kuch Ajeeb Thi (Kishore Kumar) from Khamoshi (Thank you Priti! ), a beautiful song with the black-and-white cinematography being a perfect setting for its introspective mood. My friend from Bangalore admits to an addiction to Jeevan se Bhari Teri Aankhen (Kishore Kumar) from Safar (1970); this addiction I understand, its a lovely song indeed! Kati Patang (1970) with its bold theme for those days offered good music; what I like best is Jis Gali Mein Tera Ghar sung by Mukesh. Though the voice match is not that good, Rajesh Khanna was a master of lip-synching and he made it convincing. While Kishore’s Ye Shaam Mastani from the same film is a better voice match, I prefer the soulful and sad songs for Rajesh Khanna. I believe that was his niche. The other song by Mukesh which I consider to be a Rajesh Khanna gem is Zuban Pe Dard Bhari Dastan from Maryada (1971). This and Manna Dey’s Tum Bin Jeevan from Bawarchi are the rare exceptions in my long list of Kishore Kumar songs. Kishore Kumar and Rajesh Khanna were such a superb team that at one stage it was difficult to think of one without the other, Kishore was Rajesh’s voice. I’ll start with Amar Prem’s two gems, Chingari and Kuch to Log Kahenge. A movie with such fantastic music that I will need to write a separate post for it. O Mere Dil Ke Chain from Mere Jeevan Sathi (1972) was a favourite when it was released as was Mere Dil Mein Aaj from Daag (1973). From Namak Haram (1973), Main Shayar Badnam comes to mind. The only duet I offer is Karwate Badalte Rahein (Kishore, Lata) from Aap Ki Kasam (1974), a movie with excellent music. Rajesh Khanna’s chemistry with Mumtaz is remarkable. I will not mention Aradhana again as I have already done a post on that album. I add two more songs to my Kishore-Rajesh list : Yeh Lal Rang from Prem Nagar (1974) and Mera Naina Sawan Bhadon from Mehbooba (1976). That was the end of Rajesh Khanna’s rule as the film Sholay in 1975 had already established Amitabh Bachchan at the top. ये मेरे सपने यहीं तो हैं अपने मुझसे जुदा न होंगे इनके ये साये (these dreams of mine, aren’t these the only things truly mine; their shadows will never part with me). The song seems almost prophetic. The poet writes of an approaching sunset to a life which must end soon. The clip below features a silent Amitabh Bacchan, who, within a few years, would tumble Rajesh Khanna from his throne, whose sun would indeed set. For those who would like to wallow in nostalgia, like I have, and listen to the songs I have mentioned, you can listen to this playlist in Youtube. Enjoy! What a nice album! I am not surprised that it won the Filmfare awards for Music, Lyrics and Best Playback Singer (Male) in the year it was released. The music feels fresh and lovely even now. I am listing the songs in order of the tracks in Music India Online but they are again not in the order of appearance in the film. I must say that disturbs me, as the songs have their own narrative which is lost by this strange order. Sab Kuch Seekha Maine (Mukesh) The song suits Raj Kapoor to a T. a very popular title song. 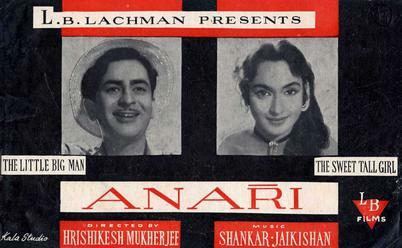 Dil Ki Nazar Se (Mukesh, Lata Mangeshkar) is the second duet in the film by order of appearance. A joyous song, sung to perfection. Tera Jana (Lata Mangeshkar) A sad song, it is interesting in that its beat is not that slow. A genre in which Lata excels. Woh Chand Khila (Lata Mangeshkar, Mukesh) is the only track with lyrics by Hasrat Jaipuri. Beautifully composed and sung, it is enhanced by Nutan’s luminous screen presence. Has there been any actress as beautiful as Nutan looks in this song? Its almost unearthly ! Kisi ki Muskuharat (Mukesh) This song introduces Raj Kapoor’s character in the film. An upbeat song with a catchy tune, it has a staccato feel to it. Cleverly composed and well sung. Nineteen Fixty Six (Lata and Manna Dey) Totally fails to capture my interest. A Helen dance number, it isn’t up to the standard of the rest of the album. I must say though that I don’t see the appeal of the persona that Raj Kapoor so often adopted in his films. I am perhaps in the minority, as his films were very successful. He has a dialogue about social conscience in this film, near the end, which explains what he was trying to say however he seems to associate honesty, integrity and humanity only with poverty and with naivety touching upon ignorance. The line differentiating the unworldly, the unsophisticated with the ignorant and the foolish is a blurry line indeed. As much as I admire the stellar qualities I listed above, I would only truly admire it when it is a result of a mind as sharp as sabre, a mind which arrives on these qualities by intellectually assessing their superiority and mindfully selecting them, not arriving upon them by mischance or naiveté. But we are talking about the music in this blog, and the music of Anari is stellar indeed.